Keep up the Chatter! This popular quilt will be the talk of the town. 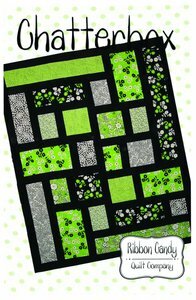 Great for large to meduim scale prints, Chatterbox works in any colorway. For some fun, fussy cut your fabrics to fit the blocks size. Whatever you choose, it will sure to be a hit. Quilt size 64" x 78".